A smokybrown cockroach laying an egg case. 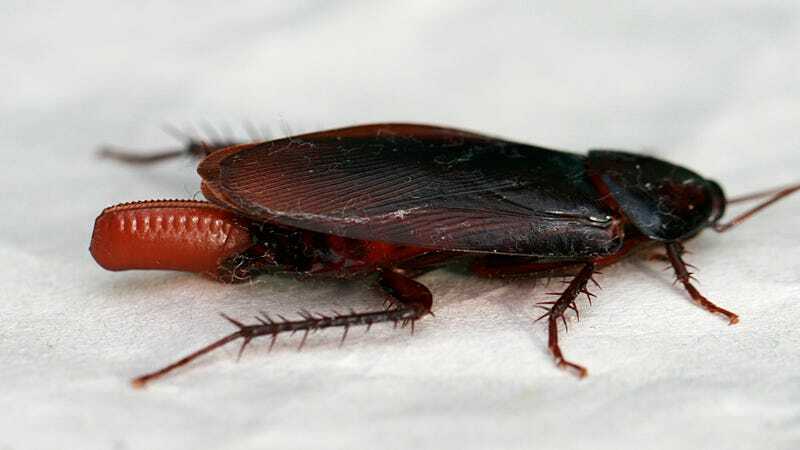 A Florida man was reportedly struggling with a roach infestation at his apartment earlier this month when he realized the problem had migrated to his ear canal. And this is your last chance to stop reading before you have to live with this knowledge for the rest of your life. The Tallahassee Democrat reports that Blake Collins got himself to a hospital after he realized one of his cockroach nemeses had lodged itself in his ear. He’d been battling an influx of German roaches for three years and the problem was now personal. “I could hear his legs inside me. It felt like someone was shoving a Q-tip all the way inside my head and there was nothing I could do to stop it,” he told the paper. To hatch, the baby cockroaches must work as a team. They swallow gulps of air, causing their bodies to inflate like tiny balloons. Their rapidly expanding girth pries apart the walls of their ootheca, allowing them to escape into the outside world. Needless to say, Collins isn’t happy and he blames the manager of his apartment complex for neglecting to handle his pest control problem after repeated requests. “The fact that she let the roach problem go on was neglect and I have suffered a personal injury,” he told the paper. Collins said he and his husband have broken their lease early and moved out. While the roach moving around in his ear may have sounded like a Q-Tip, that’s one tool the Mayo Clinic specifically warns you to avoid if you find yourself in this situation. Floating the insect out by pouring mineral oil, olive oil or baby oil into the ear is recommended. But honestly just get yourself to a hospital. And don’t drive, we don’t need people with roaches in their heads piloting automobiles.